Fashionistas, house-flippers, werewolves, the undead. Series Debut: I loved Zombieland and Shaun of the Dead as much as the next guy, but it’s time for a snark-free zombie tale—and it doesn’t get more snarkless than The Walking Dead. The setup is Zombie Apocalypse 101: A small-town Kentucky cop (Andrew Lincoln) wakes up from a coma in an abandoned hospital, only to find the streets filled with dead bodies, shuffling zombies, and every indication that his wife and son have split town; soon, he hooks up with a rag-tag band of uninfected survivors, etc. But, while director Frank Darabont (The Shawshank Redemption, The Green Mile) doesn’t skimp on the dread or gore, he wisely focuses more on the living than the undead—a must for an ongoing series (The Walking Dead’s first season is six episodes, and a second, longer season is almost a given at this point in the hype). 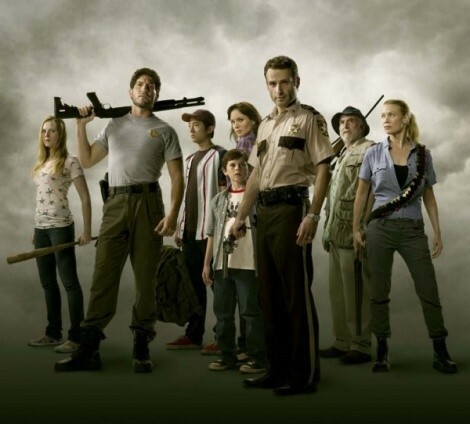 Some filmmakers are going to be pissed that the best zombie movie ever made is actually a basic-cable TV series. Season Finale: Will this season’s winner be Mondo, Andy or Gretchen? Should be Mondo—and not just because it’s fun to say Mondo … Mondo … Mondo. See? The Denver designer has been the most consistently creative, if not drama-magnetic, contestant of Season 8, and wouldn’t it be cool to have a Project Runway winner from the Mountain Time Zone? Especially after Utah’s McKell Maddox was knocked out in the first episode back in July? Besides, Andy’s a one-note constructionist, and Gretchen, well, the only place she’s going is the trunk of Meltdown Michael’s car if Tim Gunn hasn’t yet properly medicated last week’s crybaby ejectee. Mondo, FTW. Noticed how Sweet Dee has been hiding her belly this season? Since actress Kaitlin Olson is pregnant by costar/husband Rob McElhenney (Mac), it was only a matter of time before it was written into It’s Always Sunny In Philadelphia—and here ’tis: In tonight’s subtly titled episode “Who Got Dee Pregnant?”, the gang attempts to identify the father through increasingly hysterical Rashomon recollections of a drunken Halloween party. Do they learn who’s the baby daddy? Does anyone ever really learn anything on Sunny? Most frightening possibility: The McPoyle Brothers. Both of ’em. New Series: Rob Van Winkle and his crew renovate and flip houses in Palm Beach, Fla.,—when he’s not touring the world and/or regional state fairs as Vanilla Ice. Sure, I was skeptical, too, but Mr. Ice, Ice Baby knows his housing craft and gets his hands dirty in this series (he’s self-taught and has been doing this for 15 years, says here). He’s also the most entertaining host of any of the 5,994 house-fixin’ shows currently on cable. Anything less than the best is a felony, yo. Red (Felicia Day, Dr. Horrible’s Sing-Along Blog, Buffy the Vampire Slayer) is the descendent of Little Red Riding Hood; these days, the family business is werewolf hunting. Wait, there’s more: When Red’s fiance is bitten by a werewolf, she must choose between saving him or killing him. Yeah … Red: Werewolf Hunter is a dozen kinds of terrible (apparently, SyFy blew the year’s CGI budget on Sharktopus), but since Day is a queen among geeks, this will likely set minor SyFy records and prompt a sequel. Since we’re quickly running out of fish/mammal monster hybrids, this would be preferable to SquidBear vs. HippoShark.